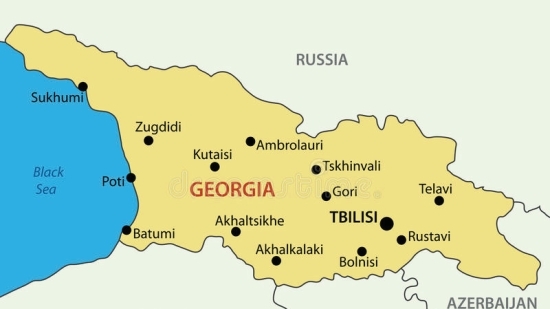 Almost no country is as varied as Georgia and that’s probably why it landed on CNN’s ‘’destination of 2018’’- list. Georgia is the land of the world’s oldest wine culture, of breathtaking Caucasus landscapes with ancient monasteries and now also of ‘Wie is de Mol?’ Fancying a life-changing adventure? The amazing contrast of Georgian nature and warm hospitality (every guest is a Gift of God” says a local proverb) of Georgian people can all be found on a trip to this beautiful country. When measuring up the world’s top wine producing regions, Georgia doesn’t usually come to mind but it should. Georgia is the birthplace of wine, where winemaking began around the fi fth millennium BC. From the Georgian language, the word “wine” spread to other European languages. Georgia is the only country in the world where wine is kept in clay vessels called “Qvevri”. This ancient method of wine making and storage is inscribed on the UNESCO list of cultural treasures. The Kakheti region is regarded as the wine capital of Georgia and is a “must visit”, especially for wine lovers. Château Svanidze, located in Signagi – one of the world`s most romantic towns in the world, offers a rare opportunity to experience the fascinating centuries-old wine history of Georgia. Château Svanidze is well-hidden from the road and opens up into a nice little oasis as soon as you walk through the entryway from the parking lot onto the lawn. Here, you will be offered a chance to unwind in the privacy of the Château Svanidze with incredible views over the snowcapped Caucasus Mountain range. From this exclusive retreat among astonishing natural beauty, you can enjoy local wines and experience the Kakheti region at its opulent best. Food plays an important role in Georgian culture. The feast is not just a pretext to stuff one´s belly but mainly a social event. 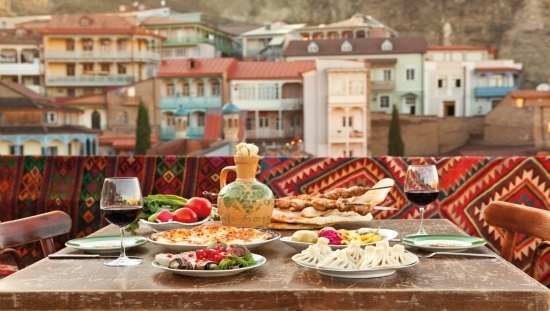 The Georgian cuisine is unique, but also carries some infl uences from other Caucasian, Soviet, European and Middle Eastern culinary traditions. Each historical province of Georgia has its own distinct culinary tradition, with variations such as Megrelian, Kakhetian, and Imeretian cuisines. Rich with meat dishes, the Georgian cuisine also offers a variety of vegetarian dishes that can’t be tasted anywhere else. The capital and the largest city of Georgia, lying on the banks of the Mtkvari River with a population of approximately 1.5 million people. Old quarters, funky clubs, churches, museums, and contemporary architecture all come together in this extraordinary place. 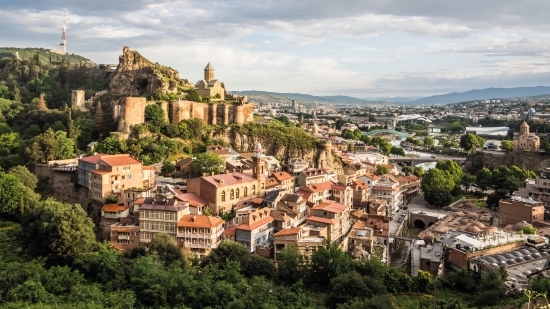 Due to its unique authenticity, Tbilisi is one of the world’s most striking cities according to National Geographic. Stepantsminda, but still commonly known as Kazbegi, is a small town in the east of Georgia. At 5,047 metres above sealevel. Kazbegi Mountain is the third highest mountain in the country, and is surrounded by myths and religious tradition. 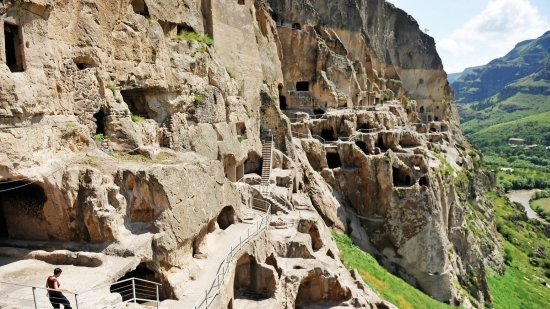 The ancient Vardzia cave city – one of the magical sites in Georgia. The caves stretch along the cliff for some fi ve hundred meters and in up to nineteen tiers and are as dramatic as the Great Caucasus Mountains. The impressive cave town was founded by King George III in the XII century and has more than 3000 cave rooms that could accommodate 50000 people. 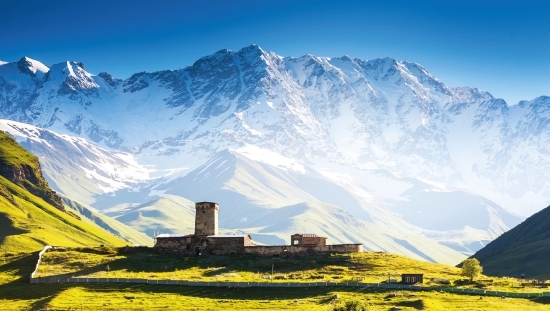 Beautiful, wild and mysterious, Svaneti is an ancient land locked in the Caucasus. A treasure that could never be tamed by any ruler. Svaneti’s symbol is the koshki(defensive stone tower). Around 175 of these, most originally built between the 9th and 13th centuries, survive here today. Curious and already excited about your upcoming trip? TikaTours is a Georgian luxury tour operator for discerning travellers seeking life-changing travel experiences. Established in 2001, the operator pioneered the concept of luxury travel in Georgia and the Caucasus region. Their luxury properties (Marani Restaurant & Bar, Chateau Svanidze & Sulphur bath’s in Tbilisi) enables them to create private ultra-luxury holidays at unbeatable value.